Fresheners Epoxy Adhesive BOSS TVB Spray Paints. Providing you the best range of thread locking 270 adhesive, thread locking 290 adhesive, thread locking 222 adhesive and thread locking 263 adhesive with effective & timely delivery. Formulated with utmost precision, our Thread locking 270Adhesive are widely demanded among the clients due to their capability to provide excellent results for all metal fasteners, including stainless steel, aluminum, plated surfaces and chrome-free coatings. Sourced from our business associate, these high strength thread lockers are ideal for permanently locking studs on engine blocks and pump housings. The range is known for their capability to tolerate slight contaminations of industrial oils such as engine oils, corrosion prevention oils, cutting fluids. It can be used in places where regular removal for maintenance is not required. 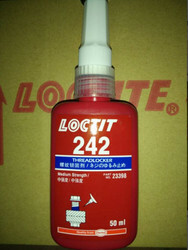 Our clients can avail from us highly effective and accurately formulated range of Thread Locking 290 Adhesives. Sourced from Henkel, one of the leading names in the industry, these low viscosity wicking grade, green thread locking liquids are ideal to be applied on varying types of threads of pre-assembled fasteners to secure them in place. Formulated with perfect blend of varying compounds under controlled condition, these adhesives prevent loosening, leakage and corrosion. Due to their application after assembly, it simplifies the preventive maintenance procedures. We have in our stores a superior range of Thread locking 222 Adhesive, which is ideal for sealing the fastener having diameters of 1/4" (6mm) and smaller. Carefully procured from one of the leading brand Loctite, these low strength purple thread locker adhesives allow accurate clamp loads. Formulated in compliance with all set industry standards and norms, these are offered in varying strength, grades, removal abilities and temperatures. We take pride to introduce ourselves as a leading distributors, suppliers, traders and retailers of a comprehensive range of Thread locking 263, which is formulated to provide permanent locking and sealing of threaded fasteners. Formulated using accurate composition of different compounds, these adhesives are suitable for heavy duty applications such as studs into motor housings, nuts onto studs in pump housings and other fasteners where high strength is required. 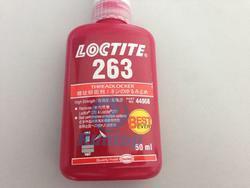 Acknowledged for providing robust curing & high temperature performance and oil tolerance, these Top Pick Locative® 263™ Primer less, Oil Tolerant High Strength Red Thread locker adhesives can be used on varying metals such as active metals (e.g. brass, copper), passive substrates such as stainless steel and plated surfaces. 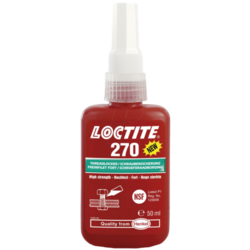 An ideal alternative to Loctite 270™, the range is also capable in tolerating minor surface contamination from various oils, such as cutting, lubrication, anti-corrosion and protection fluids. Looking for Thread Locking ?